This outdoor wall sconce will update the exterior of your home with its eye-catching design. Featuring a black finish and matte opal shade(s), this fixture will accommodate a variety of outdoor of dicor styles. With its easy installation and low upkeep requirements, this outdoor wall sconce will not disappoint. The Contemporary Beauty Collection is well known for quality, style and value; this contemporary outdoor wall light is no exception. Expertly pairing a charming aluminum finish and easy to find incandescent bulbs, this fixture is both functional and picturesque. This well-rounded outdoor wall light is sure to satisfy your indoor lighting needs. The Pari outdoor wall sconce brings contemporary and modern design with fun detailing. Bubbly seeded glass shade is placed on an antique silver frame with modern details. This fixture will stand out in your outdoor dicor. Outdoor living has never been so popular, and Globe Electric loves to provide a splendid finishing touch. The cool round shape and seeded glass shade of our Balvin Outdoor Wall Sconce is complemented with a matte finish to elevate this fixture into the epitome of modern design. The seeded glass is a lovely touch that casts a light, sweet shadow on your outdoor space. The round shape is a unique design that will set you apart from all other houses on the block and will be in fashion for years to come. The sleek matte finish is the ideal finishing touch. Complete your outdoor space with the Liam Collection by Globe Electric. The matte finish and frosted glass shade of the Liam Outdoor Wall Sconce pair perfectly with the arched arm to bring a warm but austere element to any space. The mesh detail completes the look. Perfect for any area, Globe's rustic Liam Wall Sconce is perfect for outside or inside use and adds distinctive style anywhere you place it. Includes all mounting hardware for easy installation and requires one medium based B11 60W max bulb (sold separately). 1-Light Black Outdoor Wall Sconce with Matte Opal Glass - 9.125 inch This outdoor wall sconce will update the exterior of your home with its eye-catching design. 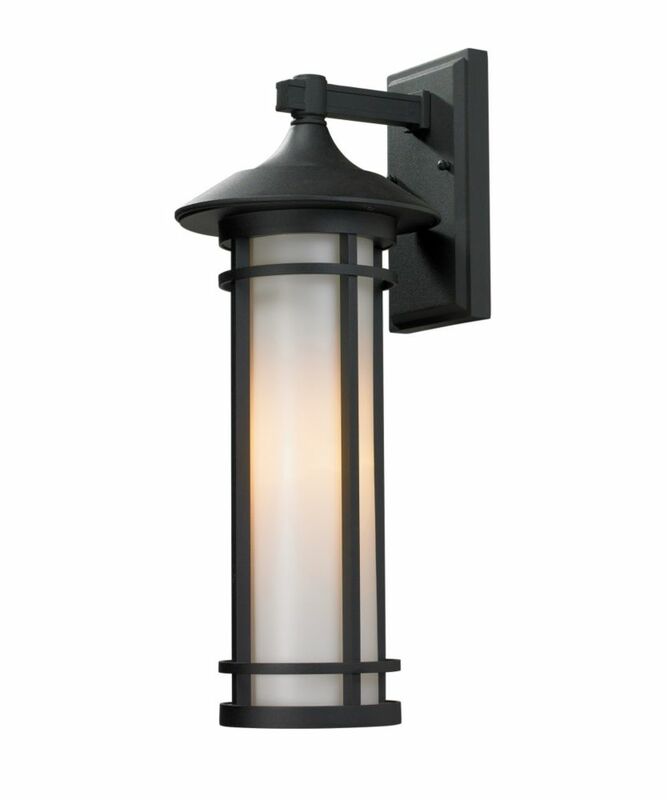 Featuring a black finish and matte opal shade(s), this fixture will accommodate a variety of outdoor of dicor styles. With its easy installation and low upkeep requirements, this outdoor wall sconce will not disappoint.